HOWDY D-L! Hope everyone is having a great week! So I have had the chance recently to sit down for a bit with Aaron aka “InsaneNemesis” (definitely the most brutal Dev name so far). I’ve been following him personally for a while and have passed a lot of cool stuff on to Kellex and even demanded he post this all the way back in July! He complied…. When I heard Aaron (17 year old whiz) was working on a new project I knew I just had to catch up with him and have him give me the scoop and how this young dude got into all this! I give you the 4th installment of The Tato Series! Tim-o-tato: Hello sir! Mind introducing yourself for anyone who may not know you? InsaneNemesis: Hello my name is Aaron (InsaneNemesis) and I develop for ShadowROM. I am 17 years old and am currently a Senior in High School. Tim-o-tato:Wow! How long have you been developing for the community? Tim-o-tato: ShadowROM….there has been lots of talk about it. Mind letting us in on the hype? Whats it all about? InsaneNemesis: Well it is a highly source modified CyanogenMod based beast! There are some never before seen things, some features utilizing some of the less noted parts of CyanogenMod. Billygalbreath and I both hope this is our best release and we have certainly put lots of effort in it. Tim-o-tato: So let me get this straight: You’re a Senior in High School? And you’re building “beastly” ROM’s?!? That is not what I was doing in High School! What got you into all this? Tim-o-tato: Well that’s great! So not just anyone can say, “Hey I wanna Dev!”. How were you able to learn the coding aspect of it? Any background in that?? Tim-o-tato: So before you met up with Billygalbreath what were you doing ROM wise? 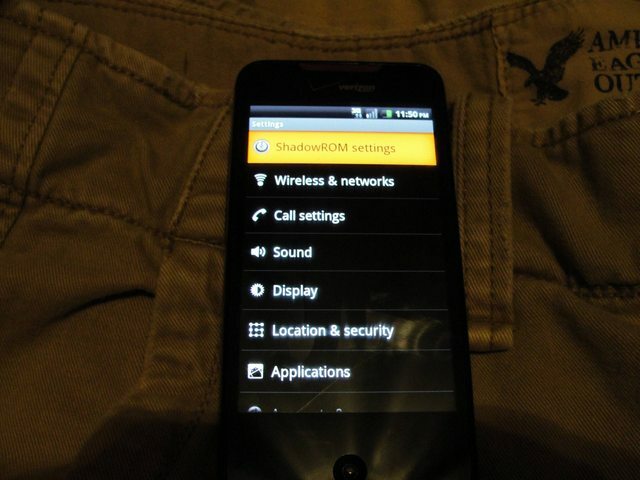 InsaneNemesis: Well I was working on my own ROM Insanely Clean which was going well and I had a lot of users and stuff. Then I wanted to branch out and work as a team. Me and Billygalbreath started ShadowROM and since then that’s been my first priority. Tim-o-tato: What are a few words you would attribute to your work with ROMs? InsaneNemesis: Clean, fast, simple, and unique. Tim-o-tato: Excellent! Now we’ve mentioned your age a bit. Does any of this sometimes get in the way of your schoolwork at all? Or social life in general? InsaneNemesis: Not during the summer. When school starts up I plan on studying and doing homework then Android stuff. Then while I’m at school my laptop will compile for me everyday at 8AM if its on and in Ubuntu. Tim-o-tato: Haha Nice! It’s good to know we have people out there taking the time to do all this amazing work that benefits the Android Community! InsaneNemesis: Well I want to go to college and eventually go into the field of engineering. Tim-o-tato: Excellent! Can’t go wrong there! Are there any other Devs you’re keeping your eye on? Tim-o-tato: So do you think anything is missing then from the community? Android as an OS has gotten more user friendly every time they release a new version. The community is great but not perfect. There will always be bad apples. But other than that I think people in Androids Community help each other are devoted and are respectful to other users. Task Killers. What are your position on them? Tim-o-tato: So, Mr. Steve Jobs personally writes you and says, “Please work for us!”. What would your honest answer be? Tim-o-tato: You’re very well spoken. Well in closing…is there ANYTHING you wanna ask the community? Now is your chance to get some good user feedback or to see what the people want! Any Q’s for us??? Tim-o-tato: Is basically anything fair game? InsaneNemesis: Sure! lol Not saying everything will be put into effect, but ideas are good! Tim-o-tato: Well Aaron, as always it has been a serious pleasure. We all look forward to playing with Shadow. We wish you the best! Hope to see you soon in the forums! InsaneNemesis: Yeah it’s been fun Tim! Thanks! It’s good to know there are people (let alone young people) who will become the “future of rock n’ roll” and carry the flag for development of things like this! A huge plus one to young people who are smarter than me! Yay! Stalk InsaneNemesis on their IRC Channel. Pick up their brand new ShadowROM HERE! Submit questions in the comments for our next interview with LauncherPro creator, Federico Carnales! Verizon Fascinate Deal is Actually "Buy One, Get ANY Phone"?